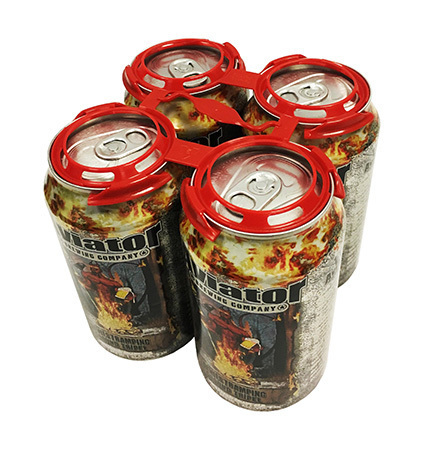 Roberts PolyPro showcases its new can handles for two, four, and six packs of craft beer that are unlike any carrying handles on the market. Craft brewers may opt to apply the handles by hand and later, as sales increase, move to the new Roberts PolyPro semiautomatic handle applicator for packaging up to ten 24-can cases per minute. Roberts PolyPro takes sustainability seriously and has created recyclable handles that use 30 percent less plastic than ordinary handles. Tabs that push-to-hold and lift-to-remove give the handles their distinctive appearance. Brewers choose vibrant colors that most attractively complement the pack’s graphic appeal. The handles allow the cans to be closely stacked for efficient storage at the brewery. These new high density polyethylene (HDPE) handles are 100 percent recyclable. On outings, the handles can be reapplied for convenient carrying home to refrigerators for unopened packaging or to recycling bins for empties. Show attendees will see a new generation of injection molded bottle handles that reduce source material by up to 25 percent for greater sustainability. These handles are designed for consumer comfort and for strength. Even with less material sourced, the Roberts PolyPro design provides superior holding power. These high density polyethylene (HDPE) handles are 100 percent recyclable. They are offered in two, three, and multipack configurations. The handles are available in any Pantone Matching System (PMS) color. Roberts PolyPro manufactures applicators suitable for every level of production, including semi-automatic, automatic, and high speed robotic machines. The Roberts PolyPro model SBH 30 is an automatic single bottle-handle applicator rated at speeds of up to 30 bottles per minute. This applicator was designed for company’s experiencing fast growth and looking for ways to transition from manual to machine application. This machine features fast magazine style handle loading, simple push button control, rugged welded steel construction, small footprint, and easy movement on casters to different packaging lines within the plant. The SBH 30 applies Roberts PolyPro EasyLift handles onto 3- to 10-liter water and juice jugs. Roberts PolyPro EasyLift single bottle handles on large jugs provide consumers with a comfortable four-finger grip. These carriers, which are 100 percent recyclable, are a consumer convenience feature for water and juice jugs. Roberts PolyPro is one of the most innovative companies in the world in terms of manufacturing handles and applicators that are good for packagers, consumers, and the environment. Roberts PolyPro works with companies across Latin America through sales agents and through the ProMach Mexico Shared Services Center in Monterrey, Mexico. The center is a hub for sales, technical support, equipment, and parts stocking (+52(81) 2139 8051). For more information on Roberts PolyPro comprehensive offering of handles and applicators, contact sales at (704) 588-1794 and visit www.RobertsPolyPro.com. Be sure to stop by the Expo Pack Booth 2508. Beverage, food, and consumer goods companies of all sizes choose Roberts PolyPro for plastic bottle, can, and box handles and application systems. Roberts PolyPro provides innovations that meet the challenges of today’s marketplace for multipacking and carrying. As part of the ProMach Filling & Capping business line, Roberts PolyPro helps our packaging customers protect and grow the reputation and trust of their consumers. ProMach is performance, and the proof is in every package. Learn more about Roberts PolyPro at www.RobertsPolyPro.com and more about ProMach at ProMachBuilt.com.